SEO SpyGlass will analyze each possible link for the important quality factors — those I talked about before, plus many more! It′ ll find links that are good to attract other sites′ visitors — and those that will be great SEO help. It′ s no secret to anyone, that if some competing site is at least a step ahead of you — this means they′ ve done something better than you did. What is this "something"? We already improved the on–page optimization of your website, based on your competitors′ best–working practices. Therefore, this "something" can′ t be a web page itself. And what remains? Off–page optimization, or putting it simple, their linking techniques. There′ s no third option — simple logic. Now you need to be the best in your niche in link building. And how are you going to look for the best links? As I said many times before, first look around to see what others do, and then do what works best. This is what SEO SpyGlass lets you do — unveil your competitors′ entire linking strategy, find the best possible links — and put them at your advantage. So let′ s see where your links goldmines lie! 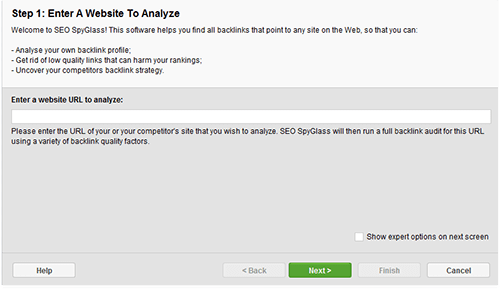 Let SEO SpyGlass do its job: run the tool. See this Create–a–New–Project window? Now what′ s your major keyword? Or probably you know your main competitor for this keyword? You can enter either, just choose the necessary option. All right, so you enter your keyword — or your main competitor′ s URL, choose the Search Engines where you compete — and wait a while. 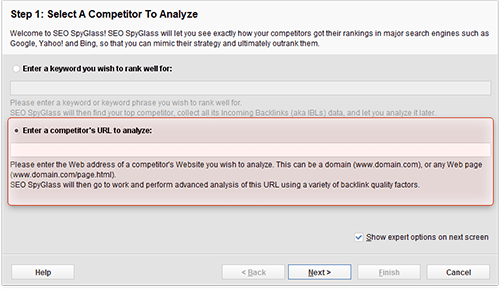 SEO SpyGlass will gather all possible links of your competitor and analyze them for a good list of factors. The software checks how good each link will be for your traffic and SEO — and puts all these data into a neat table. Moreover, there′ s a surprise for you inside SEO SpyGlass that I′ ll save for later. Let′ s look at the software closer. 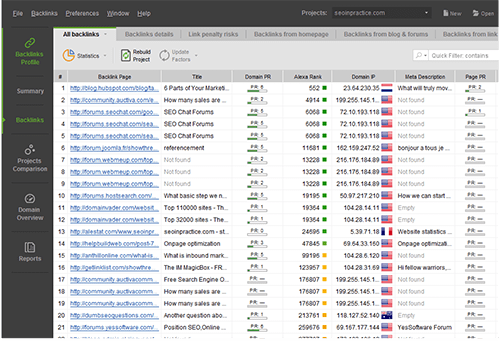 Here′ s the results tab you see, as soon as SEO SpyGlass is done with the job — and it′ s a true wealth of information. There′ s a separate row for every link, and in columns you find data helpful to judge on the quality of links. Right now, I′ ll tell you a bit about what′ s in every column and how you use that. This is very interesting. Very helpful, I have to say. I like your suggestive intakes. You know what, I was looking for something like. Back in last month, I was looking for website checker system for my office. They have helped me a lot Thanks to both of you. Is this valid for India Region also. This is sound good and easy to learn I just thanks to you. SpyGlass finds 94 back-links. Out of those 2 sites are down, 6 pages are not found, and 38 have no link. How is this to be interpreted? Does it mean those back-links are in a search engine directory that has not been updated for while? Should they be considered as useless? 81 have a link value of zero. What does this mean? 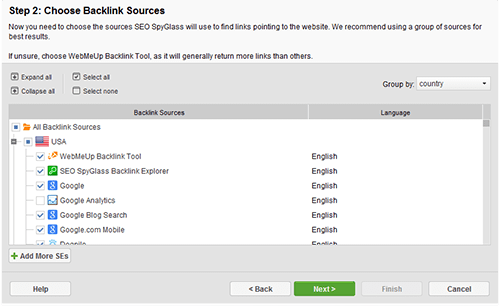 The reason is that backlinks are found with the help of web-crawlers that are instantly scanning the Internet and all collected backlinks appear in a special database where SEO SpyGlass collects the results from. But, although we find approximately 20 billion backlinks per day, it still takes about 2-3 months to complete 1 cycle of crawling. Therefore, it may happen that way that some of the backlinks might have already been removed or not yet found. I do not know how much will be useful, but I'll try to test whether the results reported. Thanks for providing so much knowledge about SEO spyglass. All the things are useful for me. Thank you very much. 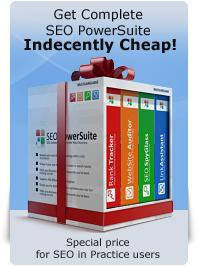 I have had SEO Spyglass for quite a while now, and I can attest to the fact that it is worth several times what it costs, and an invaluable tool and a must have for any serious web master.